Memorial Day – Gotta Make That! I have been bugging a friend of mine to make a pallet project with me forever. She was able to snag some free pallets, so we decided to do a pallet flag. They are very popular on Pinterest, and I was all for it. They were sitting on the side of her house for so long, we had to get going, so the flag was the easiest thing we could decide on that would be quick. We had to use the extra pallet to fill in the spaces. We decided agains gaps after looking at some of the projects online. We wanted 16 stripes and 50 stars too, so that meant that gaps were not gonna work. My pallet was uneven too, so my stripes are not totally straight, but I love how it turned out anyway. First we painted the whole pallet white, then we used painters tape and masked off the stripes and stars area. I was thinking maybe a laser level would work well here, but we never did find it to try it out. The hardest part was doing the math to be sure the lines were close to even and that we could fit the entire 16 stripes on the pallet. We cut out vinyl stars to prevent us from having to stencil them on later, and adhered them after the white paint dried. This way once the blue was painted, we would already have the white stars underneath, ready to be revealed when the blue paint dried. We painted the red stripes, and then the blue portion of the flag. Once it dried, we took off all the painter’s tape and vinyl stars to let the white come through. Some of the tape picked up some of the white paint, but I like the rustic look that it gave it. 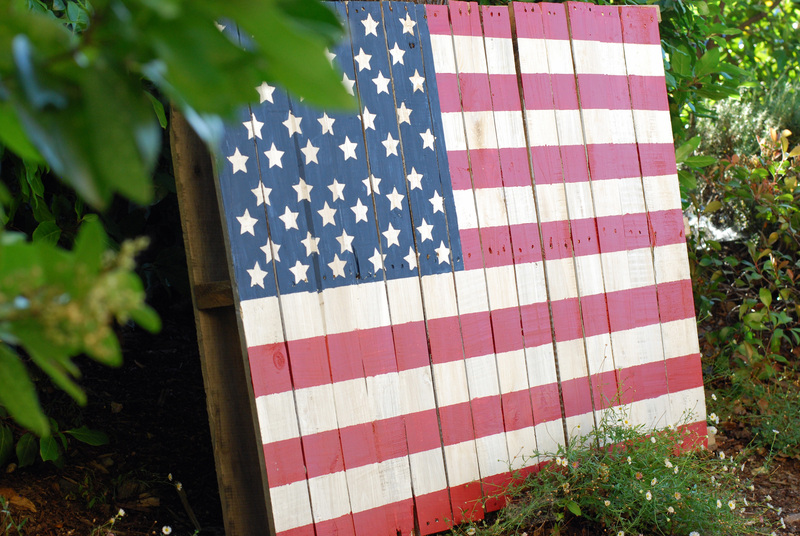 A nice craft to display for Memorial Day. Will be great to have for Flag Day, and July 4th as well. We had all the paint on hand already, and the pallets were free, so not bad!